This is one of the emails that Paul Brooks JP sent to his cronies who jump to anything he says. I will point out the obvious inaccuracies made. I always claimed my innocence and was found not guilty at a crown court where I appealed. My claim of innocence was not ‘utter nonsense‘. Paul Brooks was fully aware of my appeal but chose to blurt out this rubbish! I was attacked by 16 year old thug! This person was not ‘vulnerable’ at all! he is a menace to residents and alleged to be a local drug dealer. Paul Brooks refers to my behaviour on Social Media. What he is referring to is my fight against police corruption which I received an out of court settlement from Lancashire police complete with a letter of apology. 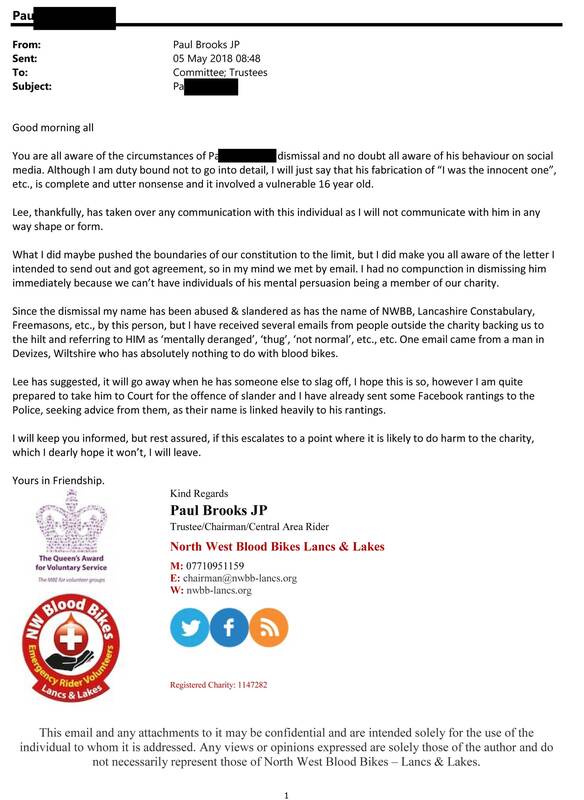 Paul Brooks says someone with my ‘mental persuasion‘ is not suited to undertake charity work. MENTAL PERSUASION. I am a victim of police brutality. Suprise suprise, Paul Brooks is an ex Lancashire police officer! Admitting it by saying ‘in my mind we met’… WHAT! The committee members had a meeting in ‘his mind’! The following email and numerous other have been provided to the police and are currently under investigation. A crime reference number has been provided. I am imploring all members to open their eyes. This charity is fantastic but Paul Brooks is a evil man at the helm and is in fact significantly damaging the charity and its reputation. I did NOTHING WRONG, yet Paul Brooks decided to attack me when I needed support, not a very ‘charitable’ thing to do! The sensible option would be the charity to invite you to their upcoming EGM/GM and allow you to put these accusations to Paul Brooks in front of the membership. 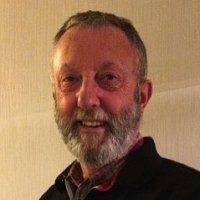 The membership can then decide on what action to take regarding reinstatement or suspension of Paul Brooks and the other trustees. In the eyes of the law the trustees act as one, if one makes a decision, they all have. They are all culpable of the same offences. I am more than happy to attend and discuss this with members, committee and trustees in public. I very much doubt the trustees or committee would allow this but I want to attend to air the problems for ALL members to see. Ouch. There are so many questions this mail raises. “I am duty bound not to go into detail” How could the committee make a decision without detail? “I did make you all aware of the letter I intended to send out and got agreement” Agreement on what since there is no detail? “In my mind we met by email” What happened to the minuted meeting that is alleged to have taken place? “I had no compunction in dismissing him immediately” So it was an individual decision and not a committee decision. If this was a company then quite a few people would have been dismissed for this kind of negligence and cover up.